Jaguar, Daimler, Sovereign, Vanden Plas, Majestic ? This is probably the most confusing name because of the Daimler-Chrysler group and the Mercedes name... so first here is a bit of history courtesy of Stephen Gibson of Supercat Jaguar Spares. It was in 1891 that a British syndicate acquired the Daimler engine patent rights and the selling rights for the United Kingdom and colonies (except Canada) of Daimler Motoren Gesellschaft headed by F.R. Simms. It was not until 1896, a year before the Emancipation Act which first permitted motoring in Great Britain, that another member of the original syndicate - Harry J. Lawson floated 'The Daimler Motor Co. Ltd. They made Gottlieb Daimler honorary president but upon Gottlieb's death in 1900 the German connection was severed forever. The company set up in a disused cotton mill in Coventry and one of the early Coventry cars was the first car to travel from John O'Groats to Lands End. EdwardVII, then the Prince of Wales bought a 6hp Daimler which marked the begining of a long Royal patronage for the company. In 1910 the company was absorbed into the profitable Birmingham Small Arms group (BSA). War time production varied from staff cars, lorries,ambulances, aero engines, aircraft,tractors, tanks and shells. After the war in 1919 two 30hp and a special 45hp model was launched. Four wheel brakes were standardised in 1924 along with thinner sleeve-valves for greater power. Four special 57hp Daimlers were built for King George V during 1924. In 1926 Daimler chief engineer Laurence Pomeroy designed the complex sleeve-valve V12 Double Six, then in 1930 brought out the Fluid Flywheel. In conjunction with the Wilson preselector gearbox, this hydraulic coupling gave a simplicity of control unrivalled at the time. In 1931 the Lanchester company was acquired. Lanchester had built the first all-British four wheeled car in 1895 and was known for its quality products which now mirrored the current Daimler range. Post war austerity was given a slap in the face with what became known as the 'Docker Years'. Lord and Lady Docker (he was a director of BSA) had "very special" Daimler models made with the most flambouyant styles imaginable, some bordering on the edge of bad taste. There is no denying that the Dockers kept the Daimler name in high profile and no doubt created great PR for the company. It was in 1960 that Daimler was taken over by Jaguar who simply needed manufacturing space to expand but also received the 4.5 litre Majestic Major engine which was so good that it had to sidelined so as not to show the XK engine in a bad light. The glassfibre bodied SP250 sports car designed by Edward Turner carried on for a short while until it could be decently abandoned and the Turner V8 engine was used in the Daimler 250 model running alongside the Jaguar MkII. Then the Daimler as an entity of its own was no more and became the badge engineered varient of Jaguar Cars Ltd. The Daimler name and pedigree is acknowledged by being the very best that Jaguar can offer in saloon cars and the past limousines. On the German side... During the 1890s the Austro-Hungarian Consul in Nice, Emile Jellineck was also the local agent for Daimler cars. He commissioned batches of cars which he sold to his wealthy acquaintances and was therefore able to persuade Daimler engineer Wilhelm Maybach to design more powerful cars. Jellineck ordered a new model as a car of today for tomorrow and it appeared in 1901 and combined the most modern design features. Jellineck named this new model Mercedes after his eldest daughter so as to boost sales in France. The Daimler company soon adopted the Mercedes name for all their private cars and development of the original Mercedes 35hp were built under the name of Mercedes-Simplex. These cars increased in power until the mighty 9240cc 60hp with overhead inlet valves and 80mph performance was achieved. Maybach did not get on with the Daimler management and resigned in 1907 to be replaced by Paul Daimler, son of Gottlieb. The Mercedes marque dominated the international motor racing scene before the outbreak of the Great War and was the chosen marque of the Kaiser. Post war, Paul Daimler carried out supercharging experiments with the first production supercharged cars appearing in 1921/2. Ferdinand Porsche became chief engineer in 1923 and introduced a blown overhead camshaft six cylinder. This was developed further into the Type K (for 'Kompressor') and produced 110bhp unblown and 160bhp when blown. By 1926 there was an amalgamation between Mercedes and Benz and the newly formed group could draw on the technical expertise of a team headed by Ferdinand Porsche and included Hans Nibel and Fritz Nallinger. All three were appointed to the board of the new Daimler - Benz company. The '89 and '92 are obviously round numbers - I would think that the numbers for '89 are quite a bit too high, since it was introduced late in the model year. The '92 is also more rare than the '90. 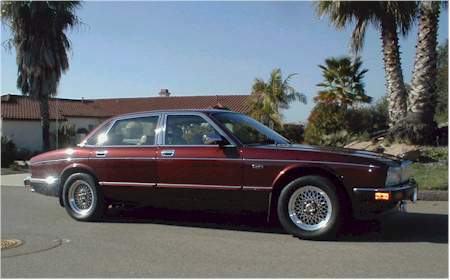 The U.S. VDP Majestic was a High-Trim-Spec Vanden Plas, with the same 113 inch wheelbase as the other XJ40s of its time (this was before the long-wheelbase (LWB) car was imported into North America). The 89-90 VDP Majestics were identical in trim specification, with the obvious exceptions being the mechanical differences between the 1989 and 1990 model year cars (3.6->4.0, 4-Round Lights->Composite Lamps, power hydraulic system driving the brake booster vs. electric pump, ..etc..). They all have 6-cylinder engines, the XJ12 was never called a Majestic in the U.S. The VDP Majestic usually included every option available. All VDP Majestics will say "Vanden Plas" on the left plaque between the taillights and "Majestic" on the right plaque, laid out in gold electroplate in a script style with a gold outline. The '92 models have a Majestic plaque or inscription on the interior dash wood. The car does not say Jaguar anywhere on the outside except in the bumper strip along the side, to the rear of the front wheel wells. They came with special color-matched lambs wool carpets for the passenger and rear foot wells. The '89 and '90 VDP Majestics were painted Regency Red with Magnolia interiors finished with Burgundy piping. The 1992s were all painted Black Cherry (a very dark deep red that looks black except in direct sunlight) with Creme interiors. The '89 and '90 came with diamond-turned 15" BBS-style lattice rims as often seen on the XJ-S, with the spaces between the lattice spokes painted body color. The '92 didn't have these wheels. 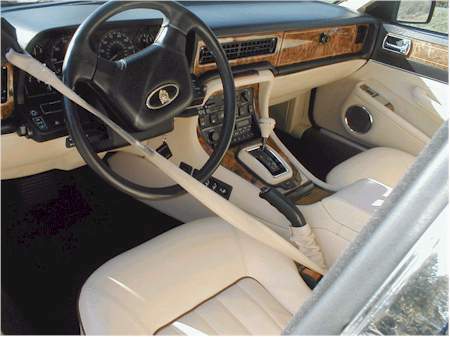 Steering wheels, gearshift knob and gearshift surround were upholstered in the interior color leather, rather than the black used in other models. They came with fluted grille surrounds and boot trim, and instead of the black growler mounted on a rectangular plate on the top of the grille, VDP Majestics have a round small red growler badge in this position. Most of the original steering wheels have been replaced by now with black, since they become extremely dirty pretty fast. They cost about $55000 - $60000 when new, about $4000 - $5000 more than a Vanden Plas. long-wheelbase XJ40 was produced and was called the Majestic, it served as a limousine version of the car. As far as I know this was never imported into North America, but was sold in England, in Europe and in Australia. When the X300 was introduced to the U.S. market in 1995, a LWB version was included but was not given the Majestic name. There are several owners of U.S. VDP Majestics on the XJ40 list. The Vanden Plas name originally comes from a dutch coach builder who designed and built a number of beautiful bodies for such chassis makers as Bentley in the 20s and 30s. Later on throughout the 60s, the Vanden Plas name was associated with Daimler, and Roll Royce. Jaguar used the name Vanden Plas in 1972 on the V12 Daimler Double Six and it has been associated with the most luxuriously appointed XJ series cars ever since. More recently the Vanden Plas badge has been reserved for US market XJ6s and XJ8s featuring the longer wheel base platform, flutted grille and boot lid trim, rear picnic tables, veneer inlays on the dash and doors, and lambswool rugs. Suspensions are tuned for comfort with different style wheels. In 2000, Jaguar launched what may consider the ultimate long distance tourer, the Supercharged Vanden Plas XJ8, combining all of the Vanden Plas luxuries with the punch of the 370hp blown V8, the same drivetrain found in the XJR and XKR.